You read about a great, new “vintage” store that opened downtown, “secondhand” stores like Grailed keeps getting a lot of hot press, and you heard up-and-coming ethical brands have clothing that’s “made to last”. But what does it all mean? Ethical fashion has a lot of terms you may not be familiar with. Even though you’re armed with a definitions guide, there’s more words that are well worth learning about. Besides, clothing with history or a story to tell is a lot more interesting than mysterious clothing with unknown origins. Clothing from previous eras that are between 20-100 years old (clothing that is 100+ is considered antique). 90’s clothing is now considered vintage, because it meets this requirement. Second hand, used, preloved, it goes by many names, but it’s the same concept. Clothing and accessories that were previously owned by another, can now be owned by you. Most clothing donated to thrift shops are perfectly wearable. Why wear second hand clothing? It’s exciting to support artisanal jewelry, embroidery, or craft that is made by locals of that specific craft. When you invest in cultural artisanal made fashion, you support artisans that continue to make their craft by hand. You help preserve a craft, which often times, have been passed on from generation to generation. How special is that? The unethical alternative (or the norm) is mass produced clothing and accessories with no history, or oftentimes the concept of appropriating them. Simply put, it’s products mad by hand. This can range from a one-person operation of a designer cutting and sewing everything themselves in their own bedroom to a studio or factory owned by small/ethical companies where employees manufacturing products themselves. Be warned, as lovely it is to support “handmade” products, it’s not always easy to find out whose hands made those products. Smaller brands and transparent companies are more reliable. Pesticides used to preserve non-organic natural fibers cotton are extremely harmful to farmers who harvest cotton. Organic fibers don’t harm farmers and they have longer life expediencies vs non-organic cotton farmers. Often times cotton farmers don’t have the funds to pay back debtors who has given them loans in order to buy GM cotton seeds and chemicals. There has been a startling rise of farmer suicides across India, because of this crushing debt. You can trust products that are made in small/limited quantities aren’t mass produced in large factories. With small quantities, a great amount of care can be taken to ensure that each product is made better and inspected with quality control. Designers and companies that focus on few seasons per year are also categorized as small/limited quantities, even if they do own their own ethical factories. There’s more care taken into the limited seasons they are producing under. SPONSOR: Shopbop Splits59, Cynthia Rowley Dresses, Citizens of Humanity Jeans, BEX nyc, Misha, Kobi Halperin, Tunic Sweaters, Wide Leg Pants, Saddle Bags, Men’s Begg & Co. I might have to pass this post on because I get exhausted trying to explain the difference to people. Thanks for clearing things up. You rock! A very useful guide to all the terms being used these days! 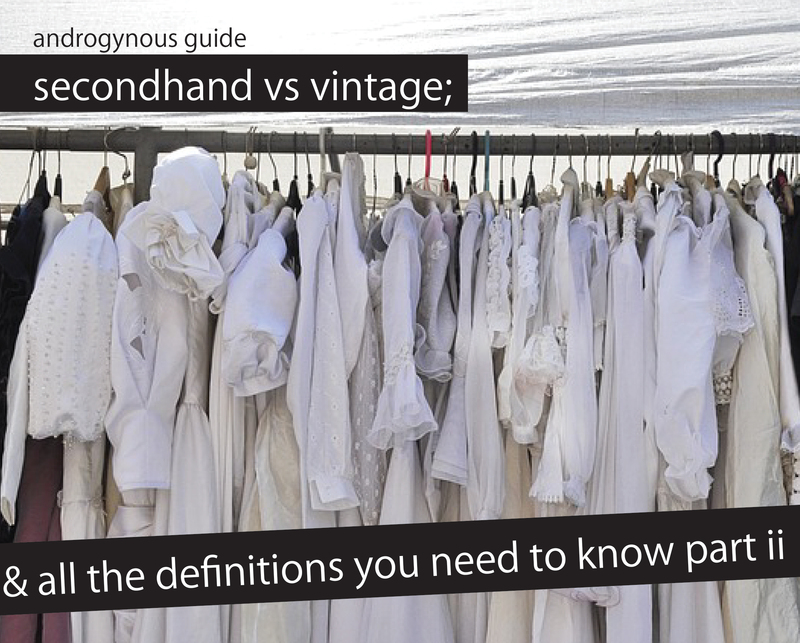 It’s especially tricky because many thrift shops/secondhand shops/charity shops sell vintage alongside secondhand clothing. A trained eye can see the difference, I think. Great post!